God's Missionary Church celebrated their 75th Anniversary and I was able to be present for this joyous occasion. Families of the founding leaders were acknowledged, there was a moment of silence in honor of the deceased, and much appreciation was showen for the present leaders and brethren. Congradulations GMC! Debbie Solley is taking out wax from a woman's ear. I was her assistant and interpreter. 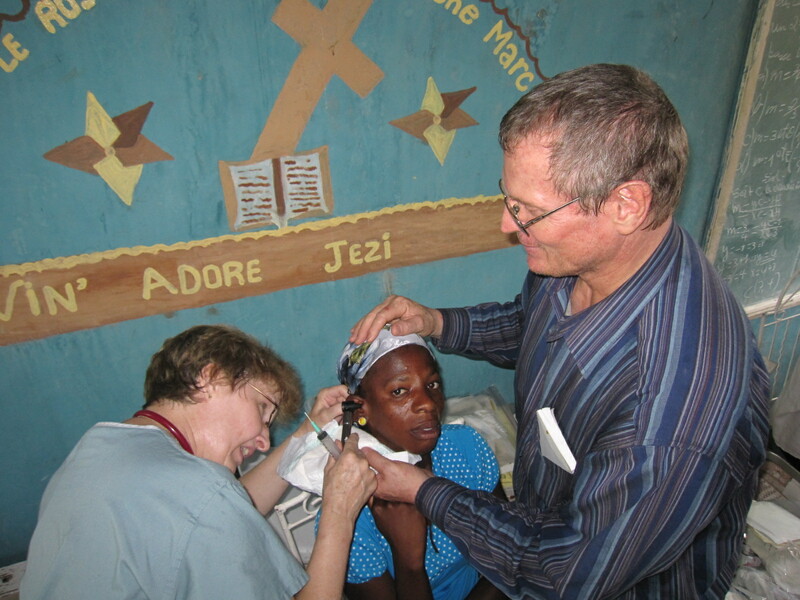 This was Debbie's third trip to Haiti after the earthquake. She loves her job as she serves the Haitian community. Jeffrey McDowell was our medicine man at the clinic. He counted out pills and help dispense the medicines. He enjoyed playing soccer with the youth after the clinic was closed in the afternoon. Elizabeth Gombosi couldn't get enough of holding these precious little babies. She also played sports with the older children. They were amazed to see her skill at soccer. Dr. Russel Gombosi and Hannah McDowell join together to help this little boy. 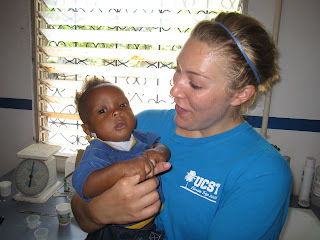 They came to help in the country clinic at La Croix. The previous team announced that a team would follow and again hundreds came for help. The medical team goes to the country. We had been working for months in the Carrefour area but there was a great need out in the country. This medical set up clinic at La Croix. Hundreds came for medical attention. 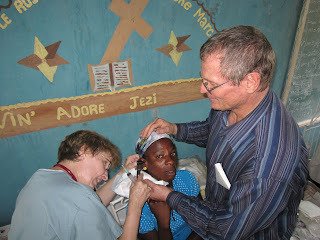 The community was so grateful for the help they received from the team. 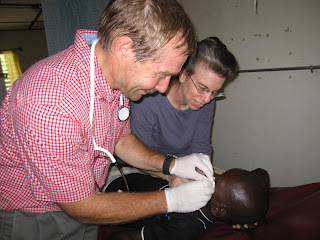 Chris was a great asset to our medical workteam. She gave much care to these precious people. Janice Springman and her daughter Carrie worked together as a team at our clinic at La Croix. Fred Springman dispensed the medicines. They were able to help many needy natives with their physical problems. Fred Springman helped in the pharmacy. He was quite busy. 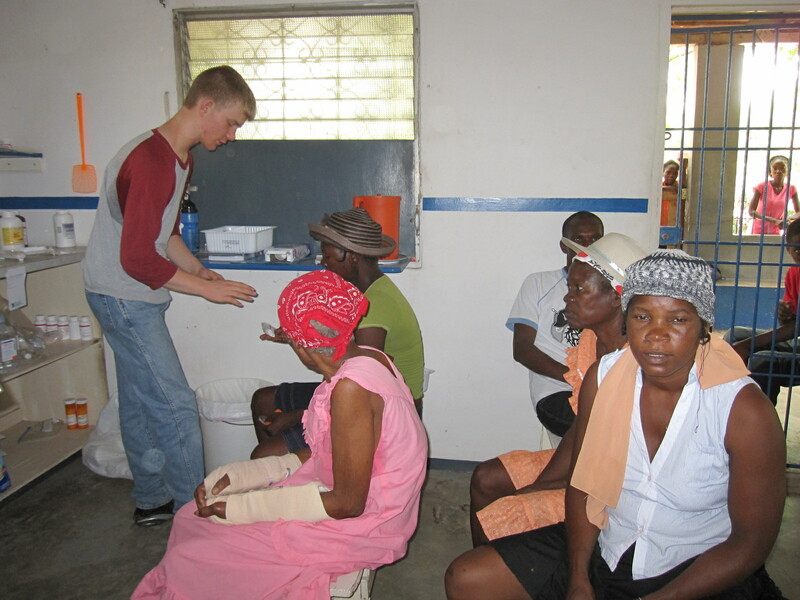 Hundreds of patients visited the clinic and all went home with at least vitamins. Our spring revival at Acadien created such an interest in the area that hundreds came. There were those who walked great distances to participate in the event. We couldn't turn them away without something to eat so a meal was prepared. A goat was provided, rice and beans were purchased, and the brethren worked together to see that the multitude was fed. The Acadien church requested a week of special services. The community and those in the surrounding areas were invited to the event. The church was packed out each evening. There were 19 new converts added to the church. What a joy it is to see the parents wanting to have their children dedicated to the church. There were 13 children dedicated on this occasion. Although there was disaster in the capital city the countryside continued their activities as normal. The Acadien church is growing steadily and there are frequently those who wish to be baptized. I was asked to take part in the ceremony where 4 brethren were baptized. Many of our brethren lost their homes due to the earthquake. Several of boys and I went to help remove piles of debris to be hauled away.